Epic Games have revealed the latest hero for their early access 3D MOBA, Paragon, and this new playable character is a bit of a hot take, if you don’t mind the pun. 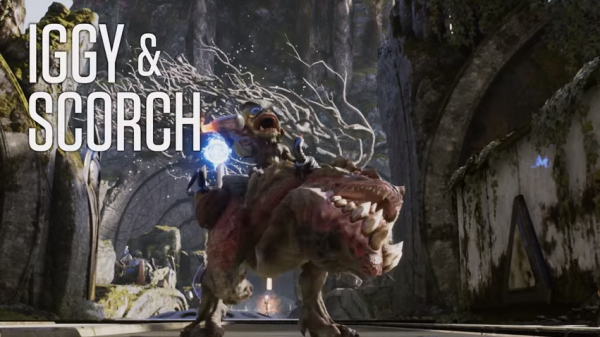 Iggy & Scorch might sound like two characters but as their reveal trailer shows – it doesn’t look like the pair can be separated, with the reptilian Iggy always attached to the fire breathing Scorch whenever possible! This pair have the ability to launch missiles, Scorch is able to roast foes with fire breath and their ultimate move calls down hell-fire from the skies! The pair will be available in just one week, April 21st, for all players who have access to the game. Currently Paragon is in a buy-in alpha state with the lowest tier costing $20 USD – an open beta and eventual free to play full release will follow later this year on Windows PC and PlayStation 4. If you want to check out our impressions of the current version of the game they are available here.